I am an amateur astronomer who doesn’t have a whole lot of spare time. Between work, family (and kids’ activities) along with my own physical fitness routines, there is very little spare time to be had for my hobby. I wanted my own backyard dedicated observatory; the difficulty was building it in a way where no part of the construction was “permanent”. Building a building (or even purchasing a resin shed type of building) would have required permits, red tape, and general nonsense that I just don’t have the time or patience for. My goal is of course to simply be able to put my camera in the focuser, plug into my laptop while sitting in comfort inside my screen porch, and tell the scope to slew and then start photographing. Enter the TeleGizmos 365 Scope Cover. I am not affiliated with TeleGizmos, or Woodland Hills Telescopes (who I purchased it through) in any way. As you can see in the photograph, I use a bungee strap near the bottom to secure the cover – since I ordered the “off the shelf” T3N8 (for 8” Newtonians) cover (TeleGizmos will make special order covers but I did not inquire about this option). Although it comes with a zip cord at the bottom, the zip cord is really made for securing the bottom of the cover around a tripod and not a pier. For those that will use this on a tripod – an extra zip cord is included which is a really nice touch. Little things make customers happy. The cover is not like the typical solar reflective material type of cover. The solar reflective material is actually the innermost lining of the cover. 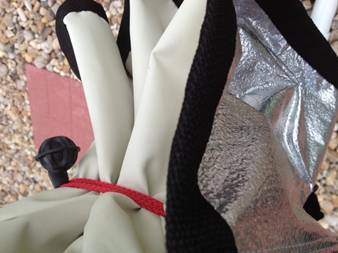 There is the outer waterproof canvas lining, some insulation, then the solar reflective stuff. All woven together and there was not a single flaw in the stitching. It’s much heavier than the typical cover as well. I own the standard TeleGizmos cover for 12”-14” Dobsonians, and this 365 cover is much heavier in weight. It feels beefy. 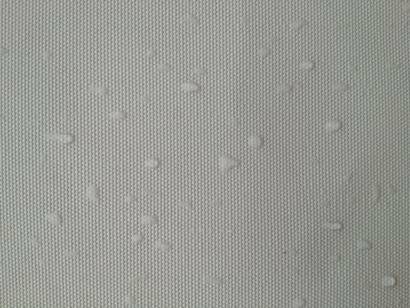 A close up of the cover material – the inside is the shiny solar reflective material; the outside being the white canvas. Note the black end stitching material where the inside and outside are sewn at the bottom. One of the really cool features of this particular cover is that it appears to have been very well thought out in design – the cover is sewn with enough space at the top to accommodate a reasonably sized guide scope in addition to the newt. 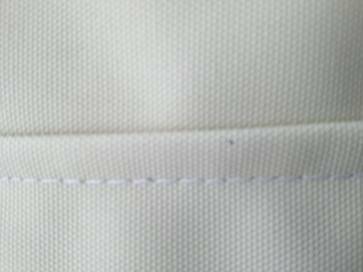 A close up of the outer canvas and stitching – the stitching is very strong and close inspection of the entire cover reveals no fraying or degradation of the stitching after 2 months of service. Whenever I take the scope off there is no condensation under the cover on the equipment. No creepy crawlies hanging around anywhere inside. The scope actually stays relatively cool, even when the sun is beating down on it. For example, the day I ran the conduit for my electrical cord and USB cables from the porch out to the pier. To access the pier, I folded the bottom of the cover upwards to keep the scope covered and out of the sun while I worked on the cable distribution. I reached my hand up to feel the OTA tube and it was not hot at all to the touch, compared to how the tube does get hot on my dob when left outside under the regular cover. In my opinion, I definitely would not have done any better in a pre-fab resin shed (my only real covered building option for the observatory) without A/C or a powered air exhaust fan. Not a single tear on the inside of the cover. I was kind of paranoid at having the reflective material on the inside - that it might rip on the metal of the tube rings, guide rings, dovetail, etc. I have probably had the cover completely on and off about 8 or 10 times. No fading of the canvas color so far even after the drastic rain to nonstop sun change in weather. Picture taken after a recent gully-washer type of rainfall – water beads on the canvas. This cover is really quite extraordinary. I believe the 365 covers run probably an average of a little more than double their standard cover counterparts – but it’s such an upgrade of material, capability and performance (not to mention manufactured in the USA) that the price really feels like one heck of a bargain. On the website, TeleGizmos makes a lot of claims about the 365 scope covers and has a pretty beefy warranty on them, which I really was quite skeptical of (I am also pretty skeptical of anything I read on the internet – especially reviews that seem to be outside the normal distribution in the unhappy / happy customer bell curve). However, my only option here, considering the challenges of building a building, was “nothing ventured, nothing gained”. The conclusion is that I am extremely happy with the purchase, and HIGHLY RECOMMEND this cover to anyone who may want to use it in a similar fashion as I do – or even for temporary outside cover solutions for star party trips, or a failsafe cover for your inside observatory. It is quite clear after using the product that TeleGizmos is not making these claims as marketing gimmicks – the performance of the product completely matches the product description, and there simply has not been any disappointment in the product or its workmanship.